Industrial park consisting of 250 acres divided into 18 lots and is for lease only. This industrial park is located within the Navajo Nation’s irrigated farm called the Navajo Agricultural Products Industry. New Mexico Located 7 miles south of Farmington, New Mexico, Located 10 miles south of Farmington; 300 acres, all utilities available, access to New Mexico Highway 371. Total Land Site This site is 250 Acres; divided into 18 lots. Comments Lease Terms are Negotiable. The Navajo Agriculture Products Industry Industrial Site is one of eight industrial sites on the Navajo Nation. Located 7 miles south of Farmington, New Mexico on State Highway 371. 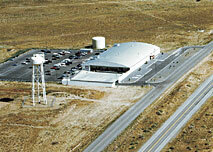 Tenants NAPI Headquarters, NAPI Farm Center, Raytheon Missile Systems – NAPI facility, Upland Desert Popcorn Company, Navajo Mesa Farms, BIA Roads Department, and LGM Beans facility. Interstate 40 is 90 miles south.